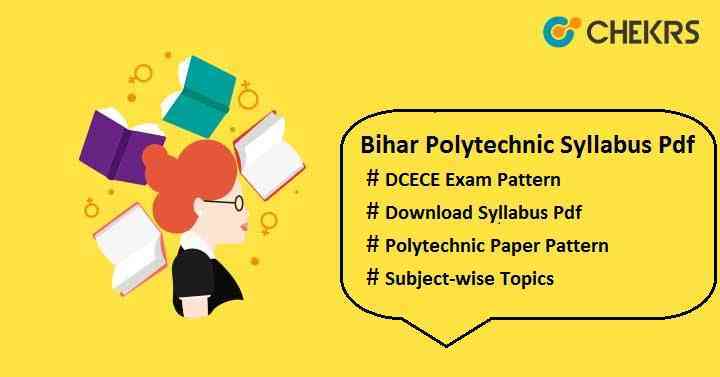 Bihar Polytechnic Syllabus 2019 Pdf: Bihar Polytechnic or DCECE is an entrance test which is conducted every year by BCECE for admission in polytechnic courses in engineering or non-engineering field. Candidates who are thinking to take admission in to various government or private polytechnic institution in Bihar state can apply for the same. Candidates can get admissions in PM (Para Medical), PMD (Para Medical Dental), PPE (Part-Time Polytechnic Engineering) and PE (Polytechnic Engineering) programmes through this exam only so it’s compulsory to crack this exam. To crack this exam, student should check the Bihar DCECE Syllabus thoroughly to score good marks in the exam. Here we have listed topics with the DCECE PE Syllabus. Check it and prepare accordingly to excel the exam. The Syllabus will be different for each polytechnic course offered by BCECEB. Like for PE & PPE, candidates will have to study class 12 Physics, Chemistry and Mathematics subjects. Whereas for PM course, aspirants have to go through the syllabus of General Science, Numerical Ability, Hindi, English and General Knowledge. For PMD, Candidates have to prepare Physics, Chemistry, Mathematics, Biology, Hindi, English, and General Knowledge. Even if you have any doubt about the Bihar DCECE 2019 Syllabus and exam pattern. Write your question in the given comment box. We will respond you very soon. Keep visiting this site to get updates. Good luck!! !